Enterprise-level security is no easy task. To detect, respond, and remediate advanced threats (and the vulnerabilities that cause them) security teams must get the most out of each security tool they use. For those with immense and complicated IT environments, your security intelligence platform should scale—incorporating cutting-edge security analytics to support everything from incident response case management and automated workflow. All of this should utilize automation to maximize the use of hunters and responders through more efficient searching, reporting, quantifying and visualization processes. 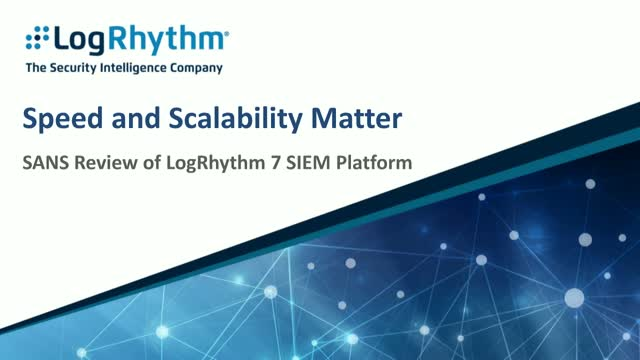 In this webcast, learn how LogRhythm reduces mean time to detect (MTTD) and mean time to respond (MTTR) through machine-driven, real-time behavioral analytics, rapid forensic search and automated response.